My two favorite things in life right now are weddings and crystals. Lucky for me, crystals are pretty trendy right now so it’s no surprise that they are popping up at so many weddings. Crystals can be used as decor, wedding party gifts, jewelry, wedding favors for guests, and so much more. 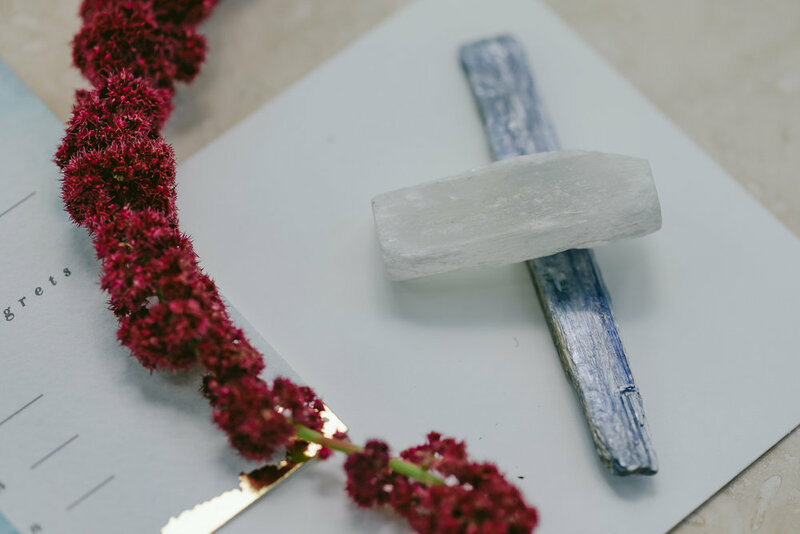 If you’re into the more spiritual side of crystal healing, you and your partner can manifest greatness together by holding crystals and asking the universe for whatever your hearts desire. 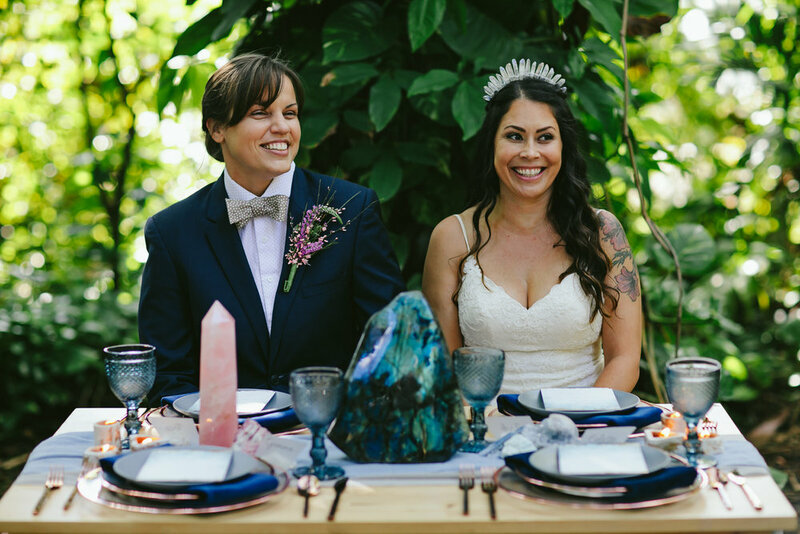 Here is some witchy wedding inspiration with some boho vibes for the badass / spiritual / crystal toting brides, grooms or non-binaries in your life. Macrame is everywhere these days and I am here for it. My inner 70’s bohemian child is all about the macrame! Crystals embedded in macrame is such a cool way to incorporate these spiritual stones into your wedding decor. This macrame piece was hand made by Knots by Linda. Adding custom hand made elements into your wedding can be so special whether you have a friend make it, find someone local or order on Etsy! Always support local or artists vs. big chains! The best part about macrame is you can reuse it in your home decor. 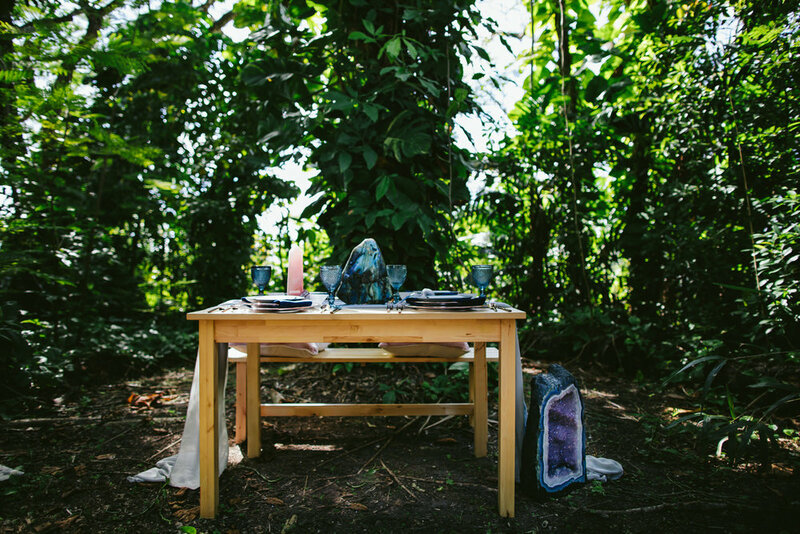 Sustainable weddings are where it’s at! 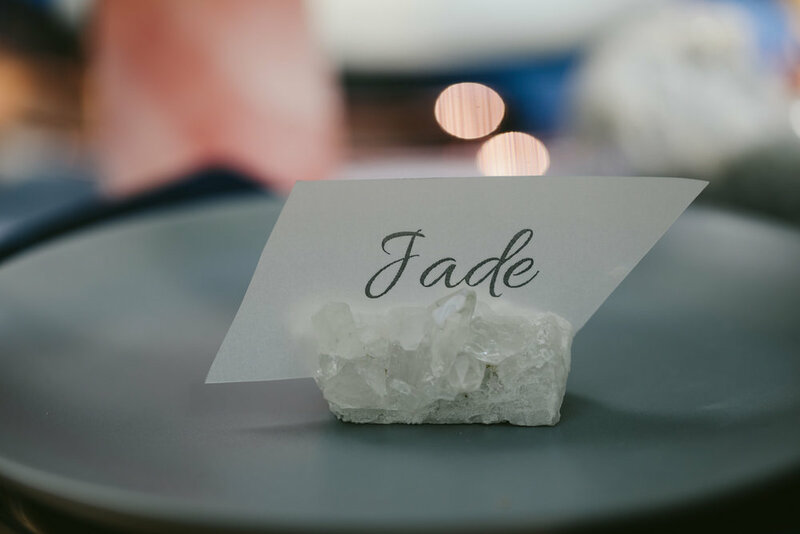 If you’re more interested in the healing properties of crystals for your wedding, Green Jade is definitely a stone you’d want to include in the wedding day decor. Jade is used to fulfill dreams and encourage a long life, it is a stone of love, which strengthens love and happiness. When it comes to bringing prosperity and abundance into your life, the Jade crystal stone is the ultimate good luck charm. Kind of perfect to have around on your wedding day, right? Green Jade stone from Crystal Vision LTC in Hollywood! If you’re not really into the healing properties of crystals, but just love the look, consider having a few stones to add into your detail shots! 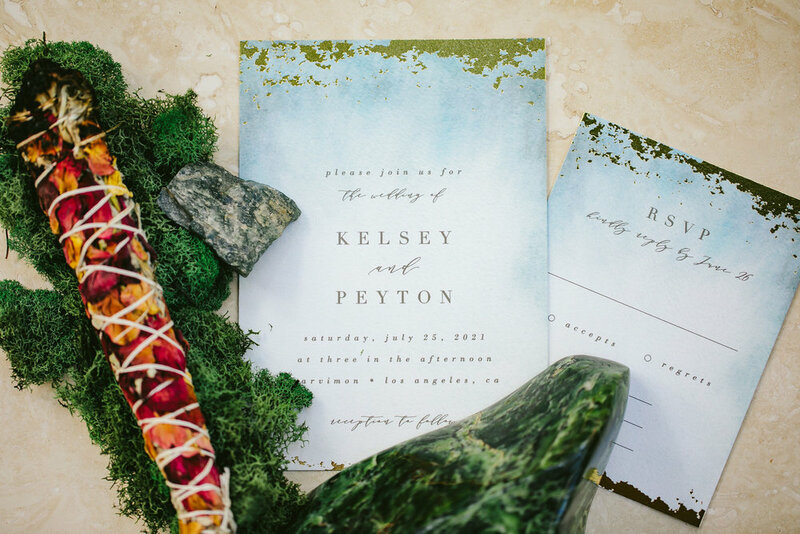 Choose stones that compliment the colors of your wedding details and stationery! Carnelian is known as one of the luckiest stones. Carnelian is a powerhouse for success, productivity and prosperity. It’s beautiful, bright orange tones are thought to bring courage, energy and creativity to the wearer while helping to get rid of fear. This crystal is all about vibrance, from its color to its energy. Carnelian is said to attract prosperity, new resources and good luck. Orange and red Carnelian are important crystals to use for love, and for the consummation of love. Orange crystals, in particular, are fertility and potency symbols and are linked with conceiving a child if that’s what you’re into. This beautiful stone is not merely an attractor of luck, but one that aligns conditions so “opportunity” is inevitable. Green Aventurine releases old patterns, habits and disappointments so new growth can take place. It brings optimism and a zest for life, allowing one to move forward with confidence and to embrace change. It enhances one’s creativity and motivation, and encourages perseverance in maneuvering life’s obstacles. The Aventurine stone is known in the gemstone world as one of the luckiest stones, which makes it a must-have for inviting good luck and prosperity into your life. 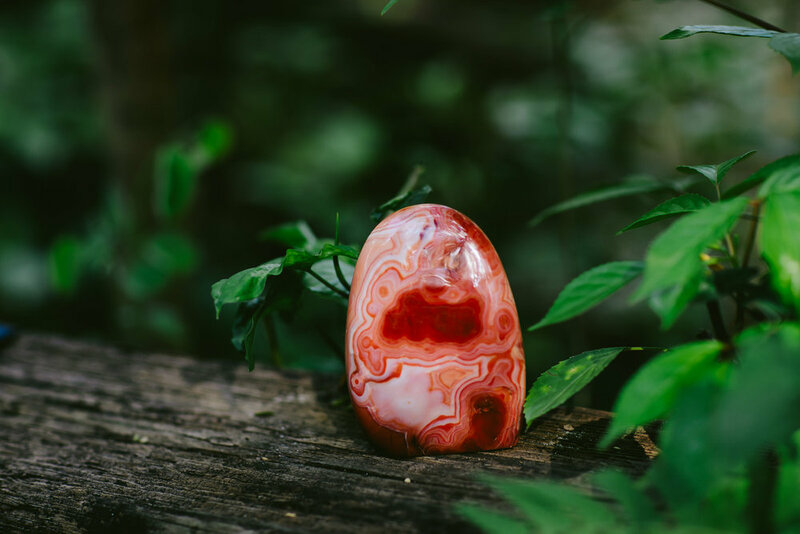 Known as the Stone of Love and Luck, carrying this stone with you will increase your confidence and your luck at attracting new love into your life. It’s also known as a Stone of Abundance, so manifest your ever expanding wealth as a couple with this one! Blue Kyanite We can communicate our ideas, beliefs, and emotions, bringing our personal truth out into the world. We have an easy flow of energy within the body and spirit. The energy that springs upward from the lower chakras can continue its path enabling free expression and natural release. Blue crystal energy will unblock and balance the throat chakra. Picking out crystals just based on color scheme is totally acceptable as well. This gorgeous dining table boasts gorgeous crystals in a variety of color from bright blues to pale pinks. Crystals come in a variety of colors so no matter what your color scheme is, you’re sure to find the right stones to compliment your decor. Bring in all the elements of nature with your crystals. Also consider building a crystal grid. Michael over at Crystal Vision in Hollywood can totally help you create a grid to help manifest whatever it is your heart desires. For weddings I think a crystal grid for communication, open hearts and luck would be an awesome choice to work with as a couple. Start your marriage off with a powerful grid to manifest together. Labradorite protects against the negativity and misfortunes. If you're looking to expand your mind and increase your spiritual growth, meditate with Labradorite and connect to higher realms of consciousness and worlds of endless possibilities. Bring Labradorite into your wedding and remember that every day holds new magic to be discovered. But also, real talk… how freaking beautiful is this centerpiece? Shout out to Crystal Vision for the UHMAZING crystals for this shoot! 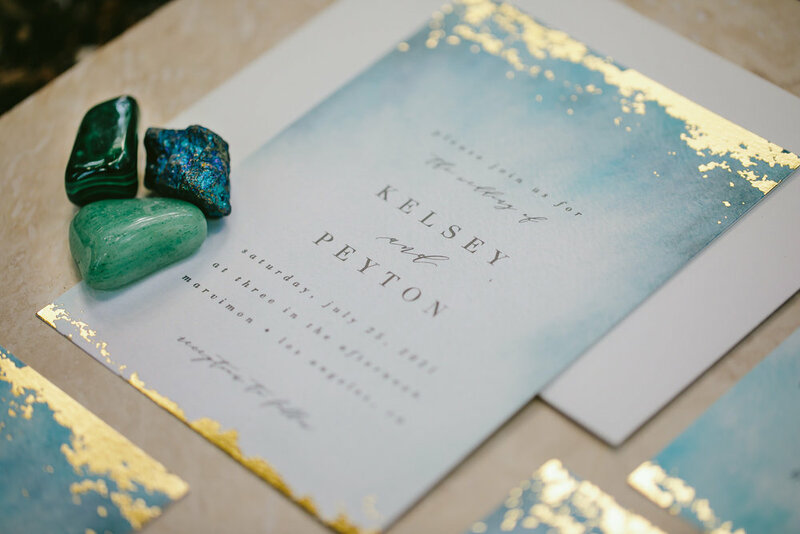 I’ve seen crystals most often in wedding decor when it comes to name plates and seating charts! Colorful flat agate stones with guest names in calligraphy is the most popular. I’ve also seen pocket stones (rough or tumbled) on top of a name card. Fun way to gift guests with a stone of your choice. You could totally pick out a stone you think that friend needs in their life, or just choose any pretty stones. The possibilities are endless in how you choose to incorporate the crystals into your wedding day. 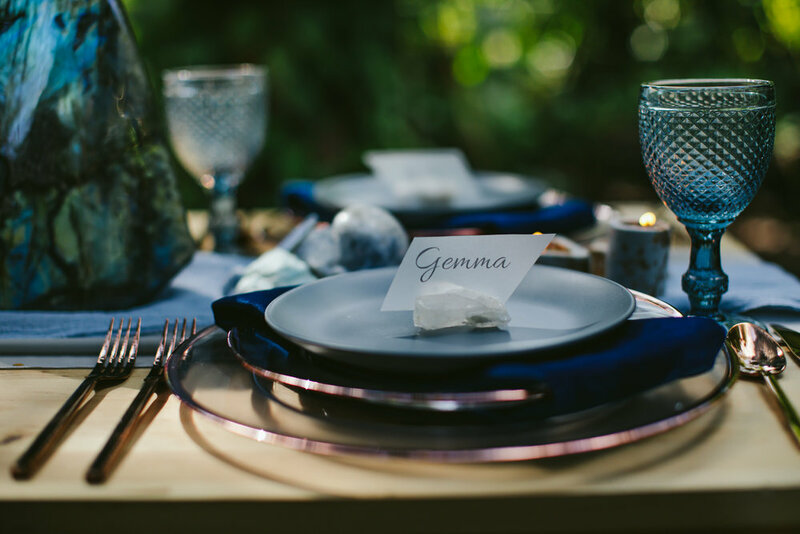 For our styled shoot we chose to go simple and use crystals as name card holders on the dinner plate. Amethyst stones are widely known from their gorgeous purple hues. These magical crystals are said to help with communication, eliminate grief and facilitate self love. Amethysts are the perfect crystals to have at a wedding for creating magic energy for the happy couple as well as all of the guests. 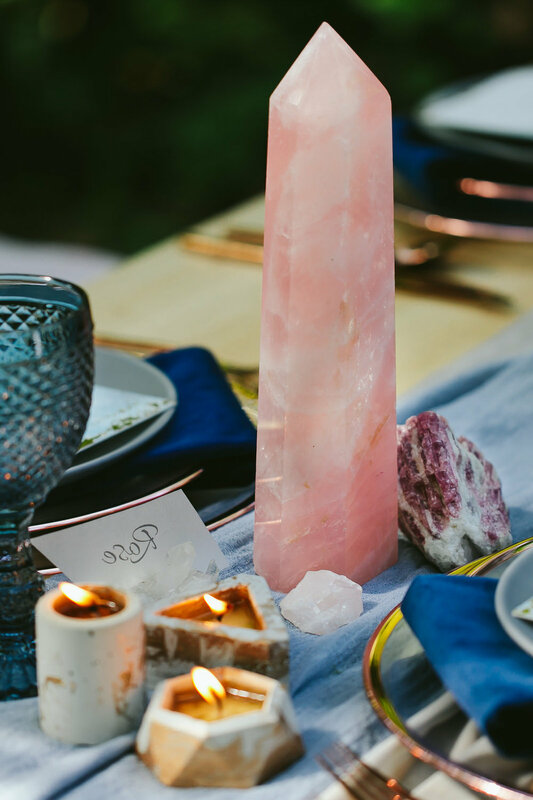 Rose Quartz is probably the most popular crystal found in wedding decor. It’s beautiful pink hues radiate love vibes. Rose Quartz restores harmony and encourages unconditional love. It provides a sense of calm, tenderness and even sensuality. 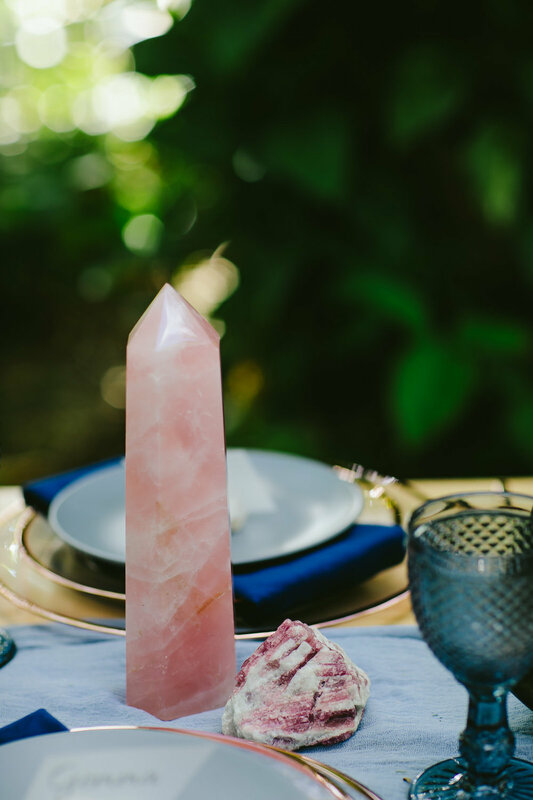 Rose quartz balances energy which is vital to a wedding day with so many different emotions coming at you from every direction. What a powerful energy to bring into your wedding day! Crystal crowns are the new flower crowns in wedding trends of 2019. So game of thrones, or fairy princess. This look isn’t for everyone, but I think if you choose to wear one, I think you can rock it. Show your wedding guests the queen you really are! We purchased this adorable crown on Etsy. FINALLY. The best part of the wedding is the CAKE of course. For this shoot we chose an amazing vegan & gluten free baker, Pac Pastries, to do a naked cake and simply adorn the cake with real crystals. 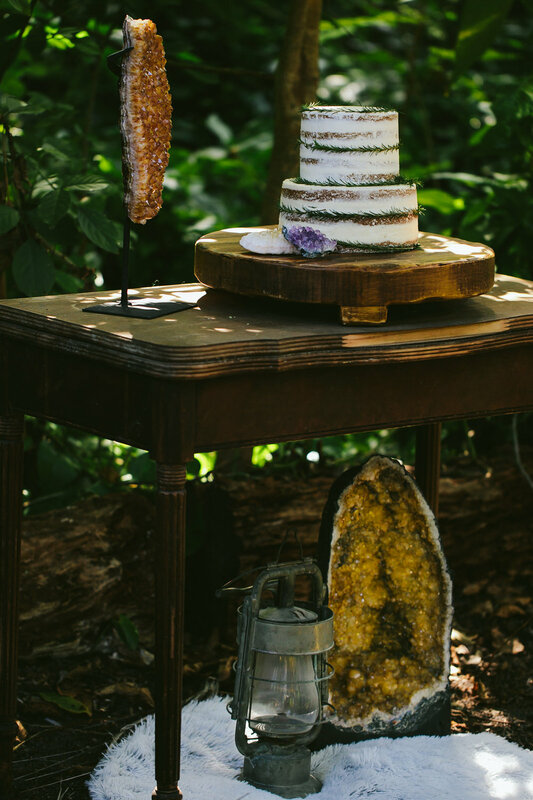 We definitely could have gone the geode cake route, but I think that trend has come and gone. If you’re centering your wedding decor around crystals, my best advice is “less is more”. 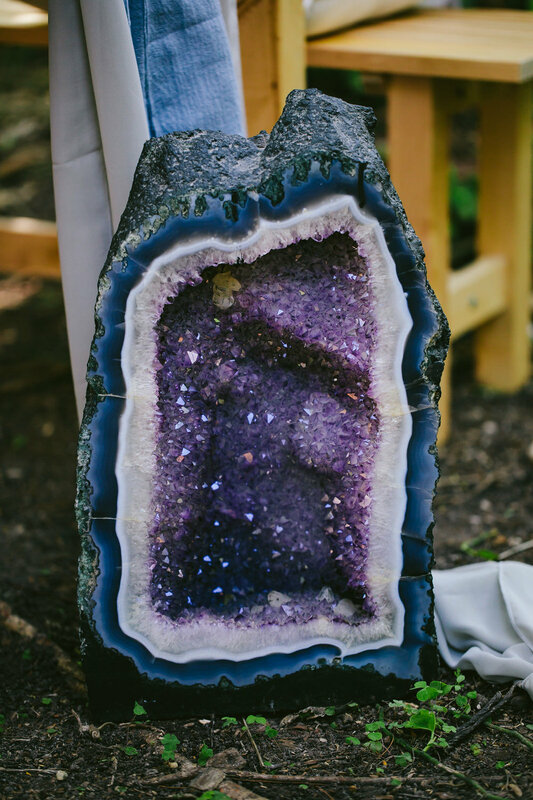 Geode cakes are great for birthdays and themed parties, but weddings are a bit more elegant and require a different vibe. A geode cake would be totally extra but it wasn’t the look I was going for. Naked wedding cakes all day for me! Adorn your cake with crystals, or just add crystals to the table and you’ve got yourself a beautiful dessert table. Citrine is the yellow stones you see above and below. Citrine is a stone for imagination and manifestation. For me, personally, citrine is my most coveted crystal. I wear one regularly and my most expensive crystal is a smokey citrine. I. AM. OBSESSED. For weddings, citrine can assist the couple in acquiring wealth, manifest dreams as a couple and helps attract love and happiness. 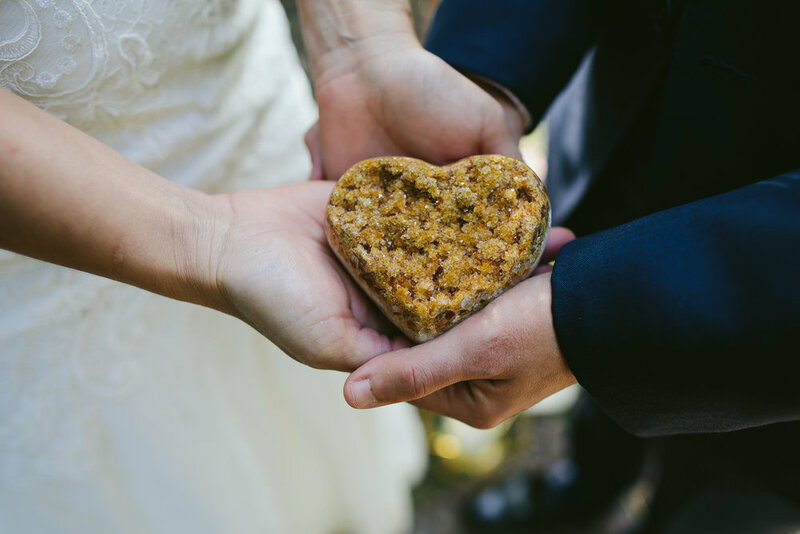 Citrine is most definitely a stone you’d appreciate having on your wedding day! Blue Celestite is a perfect support stone to help center yourself, free you of worry or fear and just bring overall calm to your wedding day. Celestite is a stone of joy and deep relaxation. Perfect for any couples who are experiencing a lot of pre-wedding stress or nerves. Have a blue celestite handy on your wedding day to calm those day of jitters! Selenite dispels negative energies. Cleanse your freaking chakras with this powerhouse of a stone. Family will always has feelings about your wedding day that won’t always align with your vision. Selenite can help you out in this arena. It clears confusion and aids in seeing the bigger picture. Luck and protection are abundant with this high vibration stone on hand. What couple entering a marriage doesn’t need luck or protection? Plus, this angelic white light goes perfect with wedding decor! Selenite is a definite must on your wedding day. Clear Quartz is a powerful stone known to be a master healer. Quartz is as healing as it is for powerful manifesting. Quartz encourages positive feelings and thoughts. This is beneficial for depression and anxiety and say, wedding day nerves! 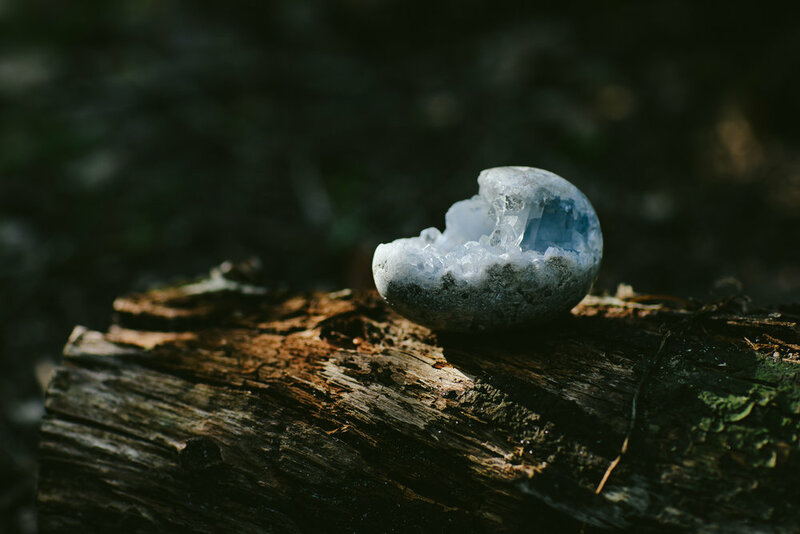 A versatile stone, clear quartz is programmable, meaning you can infuse it with your intention and then it will amplify it, working on your behalf to manifest it in the world. It also acts to amplify the energies of any other stone you are working with. Clear Quartz is easily available and completely affordable making it great for decor as well as wedding favors for your guests. Everyone can use some quartz in their life. Pink Tourmaline is an extraordinary crystal for cleansing the emotional body of destructive feelings and old wounds accumulated over time. It releases guilt, worry, depression and anxieties, and guides those emotions into self-love. It helps the emotionally numb to recover passion and find a new zest for life. Open your heart wide open, releasing old patterns and ways of thinking. Pink Tourmaline stimulates happiness and joy, peace and relaxation. Garnet has a red shade which is said to be symbolic of passion, inspiration, love and romance. Garnet is a spicy stone to have in jewelry instead of diamonds. Garnet is known to encourage prosperity, courage and gratitude. 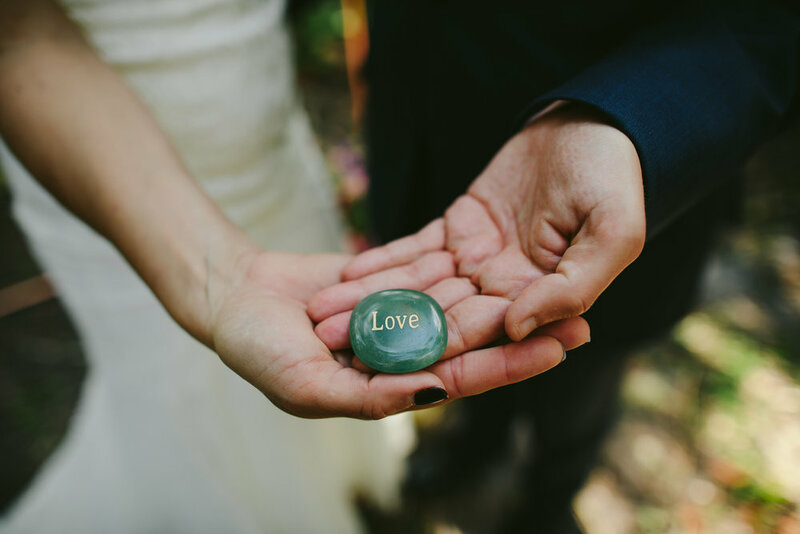 A commitment stone, which is PERFECT for a celebration of love. It revitalizes feelings and enhances sexuality bringing warmth, devotion, understanding, trust, and honesty to a relationship. If you want an inspiring way to entertain your guests, consider hiring a psychic medium for your wedding. Tarot Cards are perfect to facilitate readings for your friends and family. The models picked a card at the request of our psychic, Medium Marissa Hope and they picked “Commitment”. Can’t make this stuff up! True Story. Wedding Favors with intention are what it’s all about. Favors with feelings. Favors with meaning. Last weekend I had a wedding with the ultimate wedding favors (not pictured here) where they gave their guests a slab of selenite, a smudge stick and a beautiful message in a scroll. It doesn’t get more meaningful than that, friends. Sage, especially when gifted, is such good luck. When burned in the home, it clears negative energy and helps create a safe space. Amazing wedding favors for guests by Gina Black Art. These amazing wedding favors were created by Gina Black Art who is local to South Florida, who you can find on Etsy. Her vision for the shoot was her stunning smudge sticks made with sage and roses as well as a potpourri sachet with adorable trinkets. It would be super simple to also include a stone of your choice with these amazingly thoughtful wedding take homes. Meaningful wedding favors are always my favorite. Everyone needs some sage in their life! Crystals can add a spiritual and meaningful element to your wedding day, if that’s your intention. I hope that crystals continue to show up in weddings. It definitely can’t hurt having those extra good vibes on your wedding day! Thank you SO much for all of your efforts in helping this shoot become a reality! All of these talented vendors are LGBTQIA+ friendly! So deeply grateful. I appreciate you all.